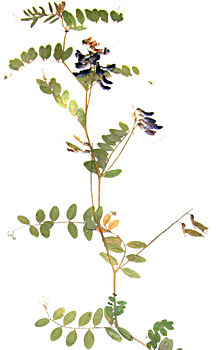 AgroAtlas - Relatives - Vicia japonica A. Gray - Japanese vetch. Vicia japonica A. Gray - Japanese vetch. Family: Fabaceae Lindl. ; genus: Vicia L.
V. pallida Turcz., V. heterophylla Worosch. A perennial plant 60-120 cm in height. Stems are slightly pubescent or completely naked, ascending, clinging, angled. The axis of leaves comes to an end as short branchy cirrus. Stipules are large, 5-7 (up to 15) mm in length, lanceolate, entire or with denticles at the basis. Leaves consist of 5-7 pairs of elliptic leaflets, blunt or with dredging above, 12-20 mm in length, 5-8 mm in width. Lateral venues depart from central venue under a sharp corner. Peduncles are thin, its length is equal or more longl than lenght of leaves together with an inflorescence. An inflorescence - one-sided raceme, rather thin, not multifloral (7-12 flowers). Flowers are 10-12 mm in length. Calyx is campanulate, obliquelly cut off; its denticles are shorter than tube, triangular-awl-shaped, upper part is shorter than bottom part. Carolla - lilac-violet. Pods are 18-20 mm in length, on a long leg, oblong-rhombic. Seeds are dark-brown, oblong-elliptic, there are usually 1-2 seeds in the pod. Hilum of a seed is linear, covers 1/3-2/3 seeds. Blossoms in June, fructifies in August. The common distribution: Japan, China. In territory of the former USSR: Eastern Siberia-Daursky area; the Far East - Zeya - Bureinsky, Udsky, Ussurijsky areas and Sakhalin. On woods and wood marges. Fodder high-protein plant, is well eaten with cattle. In cultivation keeps the high contents of fiber in green weight - up to 17,5 %. Cherepanov, S.K. 1995. Plantae Vasculares Rossicae et Civitatum Collimitanearum (in limicis USSR olim). St-Petersburg, "Mir I Semia", 990 p. (in Russian). Flora of the Central Siberia, 1979. Malyshev L.I., Peshkova G.A. (ed.). - Novosibirsk: Nauka, Т.II, p. 632,634. (in Russian). Flora of the Siberia, 1994. Fabaceae. Polozhy A.V., Malyshev L.I. (ed.). - Novosibirsk: Nauka, Vol. IX, p. 177. (in Russian). Flora USSR, 1948. Vol.XIII, Shishkin B.K. & Bobrov E.G. (ed.) - M.-L.: Publishing House of Acad. Science, pp. 445. (in Russian). Nikiforova, O.D. 1988. Wild growing wetchs of Siberia. - Novosibirsk: Nauka, pp. 82-84. (in Russian). Vascular plants of the Soviet Far East, 1989, Vol. IV. Kharkevich S.S. (ed.). - Leningrad: Nauka, P. 300, 302-303. (in Russian). Copyright on this picture belongs to Dzyubenko E.A.